On the western shore of a private peninsula, this one bedroom cottage is the perfect place to get away from it all and relax. Surrounded by conservation land, the area abounds with wildlife. There is a hiking trail along water's edge and also kayaks or a canoe for rent to explore the waterways. The cottage has the warmth of wood floors, wood beamed ceilings and comfortable furnishings to add to your relaxation. The screened in porch makes a great place to watch the sun setting over the water. There is a queen size bed in the bedroom. For those who desire to stay 'plugged in' we offer Satellite TV and Wireless Internet. The kitchen is complete with full size refrigerator, stove, microwave, toaster and coffee pot not to mention all the pots, pans, dishes and utensils you will need. If you enjoy to BBQ there is a grill just outside the front door. For lobster lovers we have a large pot available for you to cook them fresh in your cottage. The midcoast area of Maine is known for its miles of white sandy beaches and lobster wharfs where you can enjoy their famous lobster dinners on the dock as you watch the lobstermen bringing in their catch for the day. What makes the midcoast so appealing is the fact that you get to enjoy all this without the crowds. You will love the slower pace of life and the pristine beauty of this untouched area. We, Sam and Ruth Francis, are the owners and hosts of eight rental properties in Georgetown, Maine. We have four wonderful grown sons and are proud grandparents. We worked for years to finish our timber frame dream home at the tip of the peninsula. We now enjoy our role as pastors to a growing church in Bath, Maine. We purchased this unique fifty acre property with its half mile long peninsula over thirty years ago. Since then we have lived here and operated a traditional wooden boat shop. Over the years we have built six charming cottages, as well as, converted a Sailor's Loft to a rental with breathtaking, panoramic views. We also, offer the home that we first built and lived in to renters, with it's ideal location at the tip of the peninsula with deep water frontage and a private dock. We have added other touches to our property with a garden house, ten slip boat dock, a hiking trail and clearings for fishing and picnics. The cottages are situated to allow privacy but also to maintain the quality of the open, natural spaces. Each cottage overlooks the marsh and adjacent Back River which flows off the mighty Kennebec and Nature Conservancy land beyond. Reid State Park: Park facilities include two snack bars (in summer), picnic areas with tables and charcoal grills, and bathhouses with flush toilets and unheated freshwater showers. Long known as the 'City of Ships,' Bath, ME finds its soul and identity in shipbuilding. From its architecture and cultural offerings to its urban downtown, shipbuilding roots define its character. Georgetown, Maine is home to a total of 52 mountain summits and peaks. The cottage has a view of the water from the screened in porch. Lovely little place, geat view. We loved the cabin and the area!! We really enjoyed Reid State Park, it’s the most beautiful park I’ve ever been to! We are very happy with our choice to stay at The Back River Bend Cottages and will definitely stay again if in the area! Being able to bring our dog was great!! A gem! 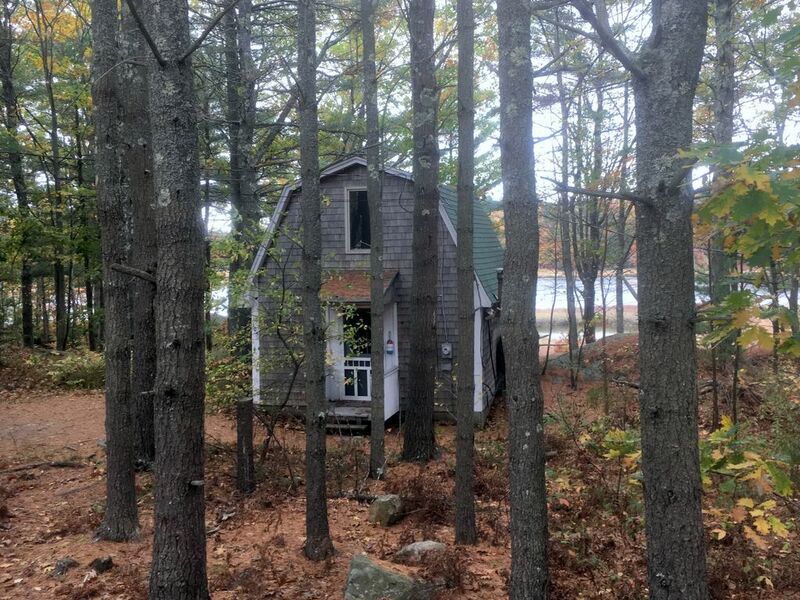 Perfect sized cabin-in-the-woods for two people, with a view of the Back River. We sat a lot on the screened in porch looking at birds, the tide and boat life. We rented kayaks a couple of days and went upstream with the tide and returned when the tide turned. I should stress that motor boats were very polite and slowed down every time we encountered one - and that was not many, so no worries if you are a "newbie" to kayaking, like we were. "Lobstah shack" (Five Islands Lobster) at the end of Rte 127 on Georgetown Island - a "must visit" place, if you are into fresh seafood. * TV and Internet - who watches TV when you are in Maine on vacation? The Internet came in handy when looking for activities, places to visit, maps, etc. The landlady Katie Francis is a real gem as well; she is a great source for information about the area and very accomodating. A pleasure to meet. Great two weeks for us! A beautiful place on the river. The sunsets were amazing on the screen porch. I look forward to going back. We had such a great time at this cabin, as it was located perfect distance from places we wanted to visit. It was very clean and had all of utensils needed to make your stay enjoyable. The view of the back porch onto the river is a perfect scene when the sun is rising/setting. There is not a lot of noise from boats or people driving by as you are set back far enough from the street. The only change I would make on my next trip is getting a bigger cabin as I went with my girlfriend and two dogs so we could've used some more space, but it is perfect for a couple people. I highly recommend staying with Back River and will most likely stay here again next year (in one of the bigger cabins)! Within 15 minute drive to: Reid State Park, known for its uncrowded sandy beaches and rocky cliffs, Five Islands Seafood, known for their shore dinners and lobster rolls served dock side in one of Maine's most picturesque harbors, Maine Maritime Museum, housing local marine artifacts dating back to 1607, and antiquing, over 25 shops within a short drive. There is a hiking trail at water's edge and a nearby deep water dock for fishing, swimming or to tie up your own boat. Rates are subject to change until reservation is confirmed. Additional fees will be incurred for pets, linen service or boat rentals.